The Sixth Day Trade Paperback is Here! Happy Release day to us! THE SIXTH DAY trade paperback is on sale today! Look at this gorgeous artwork! It’s stunning, and I love it! To celebrate, here are some insights about how we put together the book, the research we did, and a few other little tidbits. Hope you enjoy! 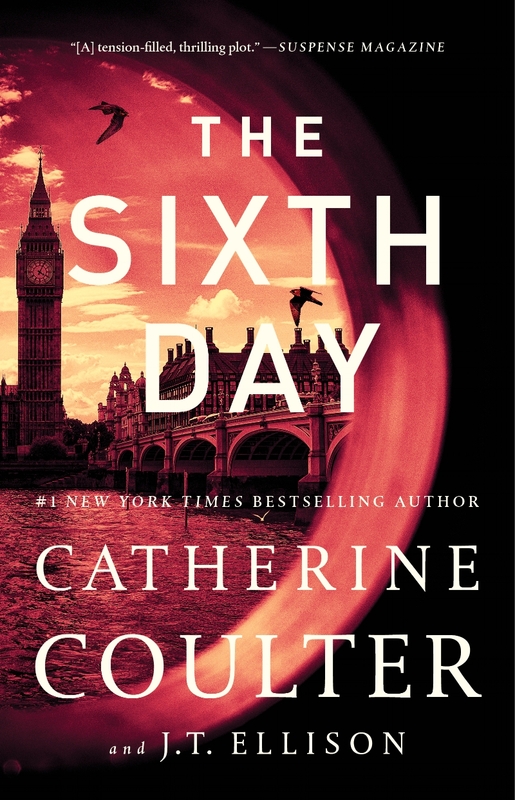 I’ll be the first to admit, naming the 5th book in the Brit in the FBI series THE SIXTH DAY shows a small lack of foresight on our part, as now that the 6th book is underway, I keep finding myself saving files to the Sixth Day folder. A small price to pay, though, for what I think is the most intricate, intense ride of the series thus far. Set in London, Nicholas and Mike are up against a villain who thinks he’s a descendent of Vlad the Impaler, and believes the lost pages of the Voynich Manuscript hold the answers to save his twin brother from the grips of severe hemophilia. (Get it - vampires, hemophilia…) Plus, there is some high-tech madness, and a drone army, and falcons named after the original Cabal. Trust me when I say Nicholas and Mike have their hands full. You might wonder how Catherine and I cook up these crazy plots. Normally, we meet at her place in California, but for this book, we set up shop in a lovely hotel in Manhattan, with oodles of tea and bacon (the staples of life) being brought by room service, and started throwing ideas against the wall. We had two basic concepts to start with — the Voynich Manuscript and Vlad Dracul — and we tossed out plot twists until they began to gel into a plausible story. We had so many cool ideas for THE SIXTH DAY I often wondered how we would manage to fit them all in. But we did, and the result is a mind-bending thriller that will leave you breathless. A part of this book’s inspiration was a family affair. I have to give props to my dad and my brothers for inspiring the falcons in the book. We were walking on the beach last year and my eldest brother mentioned a documentary he’d seen about a falcon hospital in Saudi Arabia. My dad had forwarded me a story about the French using eagles and falcons to take down drones just days before … and my middle brother mentioned he’d recently seen a story about a Saudi Prince booking seats for 80 of his falcons on board a plane. I was hooked on these ideas and ran to Catherine and said — Roman has to be a falconer. She bought in immediately, for which I will be forever grateful. In that vein, I also have to give props to Helen Macdonald for her incredible book H IS FOR HAWK (recommended to me years ago by my very first editor, so how’s that for full circle), and Deborah Harkness for introducing me to the Voynich in her incredible ALL SOULS series. These inspirations truly helped bring this book to life. I hope you enjoy THE SIXTH DAY – let me know what you think! Get Your Trade Paperback Now! Let’s celebrate with a giveaway! I have 10 copies of the trade paperback up for grabs! Giveaway is US-only (sorry, international folks!) and ends this Friday November 16. Enter on the Rafflecopter widget below or by going here. I am so thrilled to announce A THOUSAND DOORS: An Anthology of Many Lives is on sale today! Having this book out in the world is an absolute dream for me. I’ve been harboring this story ever since I saw the quote, about a young woman who is murdered, and as she dies, has the chance to lives all the lives she’d once dreamed of having. I’ve likened it to Sliding Doors meets The Lovely Bones. But it wasn’t my usual kind of story, and a very ambitious one at that, so I shelved it until I felt the time was right. I’m so glad I did, because as the years progressed, I realized how incredibly cool it would be if I had help writing Mia’s many lives. This is the most unique, exciting project I’ve ever had the pleasure to work on. It’s much more than an anthology, this is a novel. Over the course of the story, you are going to meet 16 different variations of Mia Jensen. You are going to journey through her lives, be shocked by her decisions, her actions, her vulnerabilities, her loves, her mistakes. You are going to get to know Mia better than she knows herself. A THOUSAND DOORS is on sale in hardcover, trade paper, and ebook today, everywhere books are sold. Audio is coming after the first of the year. I hope you’ll talk to your favorite indie booksellers and librarians and ask them to stock the book, too. Through the unique voices of New York Times bestsellers and rising stars in women’s fiction, A THOUSAND DOORS examines how our smallest decisions can create lasting effects, and asks the ultimate question—can we actually change our lives? I always have a soundtrack for my books, and A THOUSAND DOORS is no different… except this one was compiled en masse, with each author offering their own song to match their story. Can you guess which song goes to which life? Enter to win a $100 Parnassus Books gift card! This is my hometown bookstore and a wonderful place to shop—either in person or online. Thank you for celebrating with us! And as always, thank you for being on this journey with me. Now, get thee gone, reader, and buy your copy of A THOUSAND DOORS, STAT! I can’t wait for you to read it! I leave you with a final question. 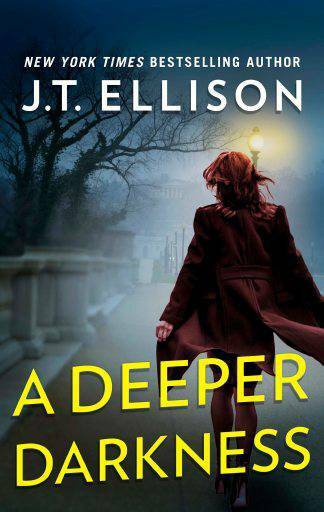 A DEEPER DARKNESS has a new ebook cover, and I absolutely LOVE it. I think this is the first time the cover really evokes the story perfectly. Since many of you are new to me, and don't know the story behind my Samantha Owens series, I thought I'd share her inception with you. WARNING: If you haven't read the Taylor series, there's a major spoiler ahead, so you may want to avoid this one. Several months ago, my team and I made a decision to let Taylor take a long vacation, and focus on a new lead character, Dr. Samantha Owens. Sam is Taylor's best friend, and Nashville's head medical examiner. She features prominently in all the books, but she hasn't had her own tale, not yet. Suffice it to say, starting a new series was scary for me. After seven (eight, including FIELD OF GRAVES, which wasn't yet published) books with the same lead character, I was in a groove. I knew how every character would react. It was simply a matter of creating a dynamic plot and a cool villain to confront them with. But Sam had been knocking on the doors and windows of my Muse’s hamlet, begging to strut her stuff on the page. When at long last I relented, and decided to spin off her character, changes needed to happen. To do the new series justice, it needed to be different. To start – a new setting. I settled on Washington, D.C., my former home of many years. And Sam needed to be unmarried, and unencumbered by children. I debated long and hard. Divorce? Custody arrangements? Multiple scenarios, but they all kept her tied to Nashville. There was only one choice. Her husband and children had to die. I fought against this reality for weeks. I couldn’t do that to her. And there are rules in writing. You can’t kill animals, and you can’t kill children. Except you can. And I did. The question became not if they died, but how. Car accident? Been done. Plane crash? Been done. And then it hit me. The flood. Nashville was stricken with a flood of biblical proportion in 2010. As it happens, A DEEPER DARKNESS released on the second anniversary of that fateful weekend, that moment in time where we lost so much. Synchronicity at its finest. I was able to both honor those hurt and killed in the real flood and give Samantha a chance to recover with everyone else. Recover we did. It hasn’t been easy, but we’re back on our feet. Another challenge was finding the right tone, the right mood, to express Samantha’s loss without suffocating the reader in her grief. I needed to get in her head, and live there, trying to understand how hard it must be to lose a husband, and to lose her twins. How, and if, that sadness could be overcome. I used a lot of music to guide me, mostly the mournful, melancholy cover of “Hurt” by Johnny Cash. (It's on the A DEEPER DARKNESS playlist.) The song makes me weep, and the video tears a hole in my heart. Imagining the loss of my own husband, how frightened and alone I would feel, helped me mine Sam’s grief. With grief comes hope. With hope comes possibility. They say what doesn’t kill us makes us stronger, and for a young, dynamic, intelligent widow, simply surviving her loss makes her invincible. Samantha stares into the abyss, acknowledges its presence, and somehow, some way, pulls herself back from the brink. And is rewarded for her strength. Yes, she's overwhelmed with OCD that manifests in excess hand-washing. Yes, she won't autopsy drownings. Yes, she runs away from her pain, starting a new life. But there are seeds of hope scattered throughout her story. Seeds of possibility. Ironically, without realizing it, I was unwittingly writing my own story. My husband and I struggled with infertility for a decade. Multiple pregnancies resulted in multiple miscarriages. IUIs and IVF didn’t solve the issue. Over and over, I lost my own children. I thought I was fine. Normal. Nominal. That I’d dealt with my own grief, my own loss. But it wasn’t until I read A DEEPER DARKNESS in galley form that I realized I’d used the book as therapy. All of Sam’s losses mirror my own. Her strength, her hope, her will to continue on gave me the strength to do the same. A DEEPER DARKNESS isn’t a sad book. Samantha Owens is all of us: our hopes and fears, our determination and our weakness. For the first time in my writing career, I’ve put bits of myself on the page. And that’s possibly the most terrifying thing of all. Whew! So now you know where my girl comes from. To celebrate our new look, I'm giving away one ebook. Enter on the Rafflecopter! I'm curious, what book turned you into a reader? And when? I know many readers who came late to the page, and many who started when they were little. It's always fascinating to me to hear how you got into books.